Hello friends aj is post me whatsapp chat popup kya h or whatsapp chat popup start kaise karte hai iske bare me bata raha hu. 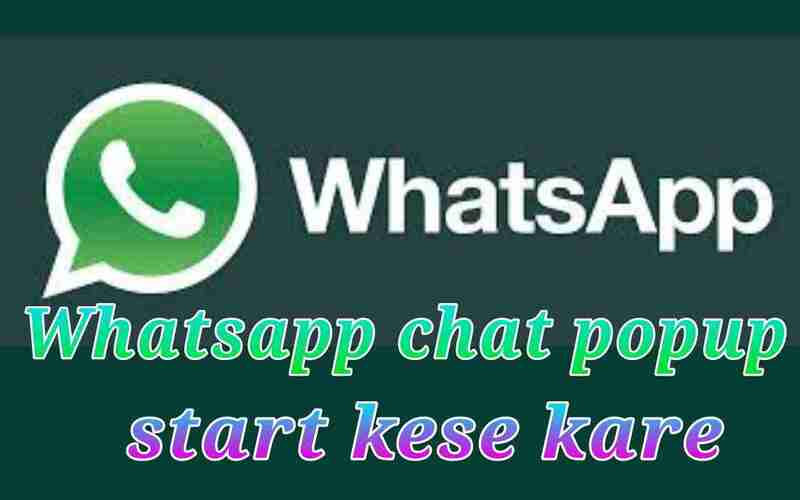 Whatsapp me chat popup ek bohot achha feature hai iski madad se ham msg aane par bina whatsapp open kiye message dekh sakte hai or sath hi bina whatsapp open kiye message ka reply bhi kar sakte hai to chaliye friends aage badhne se pehle chat pop-up kya hai iske bare me jan lete hai. 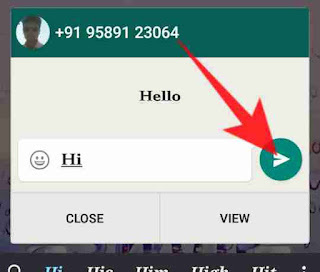 Whatsapp chat popup ek popup window hoti hai jisme whatsapp me aaye huye msg show hote hai, whatsapp chat popup window msg ane par apne ap open ho jati h or msg show ho jata hai or vahi se ham reply bhi kar sakte hai, whatsapp chat popup window sirf on screen me hi show hoti hai yadi hamare mobile ki screen off ho ya lock ho to pop-up window open nahi hoti hai, popup window only on screen me show hoti hai. Yadi ham apne mobile me Facebook use kar rahe hai or hamare whatsapp me koi msg aya to hamare mobile screen me automatic hi ek new popup window open ho jayegi or hame whatsapp me aaya hua message dikh jayega, ham chahe to whatsapp chat popup window se hi message dekhne ke bad message ka reply bhi kar sakte hai. Whatsapp chat pop-up window feature enable karne ke bad hame bar bar message dekhne or message ka reply karne ke liye whatsapp open karne ki jarurat nahi padegi, whatsapp chat popup window ki madad se hi ham whatsapp me aaye message ko kahi bhi dekh sakte hai or popup window ki madad se bina whatsapp open kiye kahi se bhi message ka reply bhi kar sakte hai. Apne whatsapp account me chat pop-up window open karne ke liye aage bataye gaye sabhi steps ko thik se follow kare uske bad ap bhi chat popup window jarur start jar payenge. 1. Sabse pehle ap apne mobile me whatsapp open kare. 2. 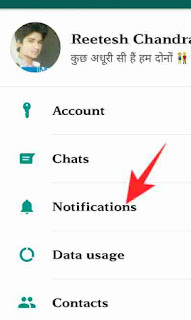 Whatsapp open karne ke bad ab ap whatsapp settings me jaye. 3. Ab yaha par ap notifications par click kare. 4. 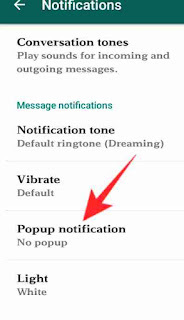 Yaha par message notification section me popup notification par click kare. 5. Ab ap only when screen “on” par click kare. 6. 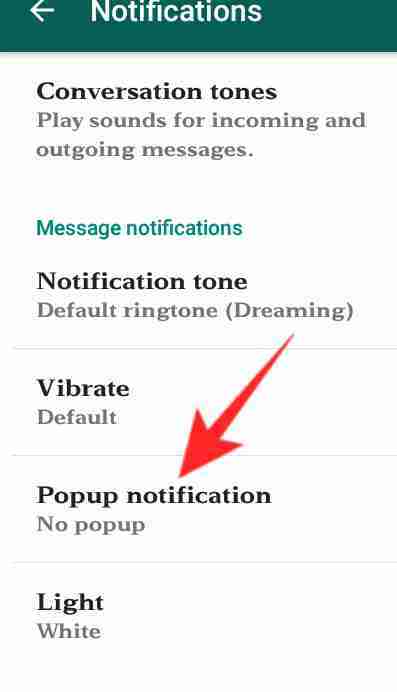 Yaha par apko sirf message notification section me popup notification start karna hai. 7. Ab apke save contact no. Ya without save contact number se jab bhi message aayenge apke mobile me whatsapp chat popup window open ho jayegi. 8. 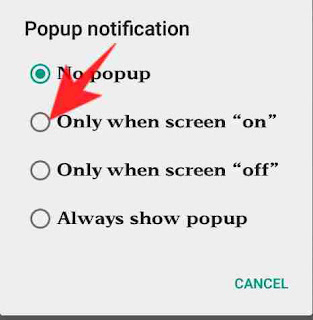 Apko sirf message notification section me popup notification start karna hai, group notification section me popup notification start nahi karna hai. 9. Group notification section me yadi ap popup notification start karenge to group me aane bale message ka bar bar pop show hoga to ap ise start na kare. Is type se ham apne whatsapp account me chat popup window open hona start kar sakte hai or apne whatsapp me aaye msg ko kahi bhi seen or reply bhi kar sakte hai, whatsapp chat popup enable karne ke bad ab hame message dekhne or reply karne ke liye bar bar WhatsApp me jane ki jarurat nahi padegi ab ham chat popup ki madad se kahi se bhi message dekh or reply kar payenge.